Floating cork vs click lock engineered wood flooring – comparison chart. 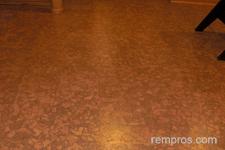 Prefinished cork flooring is available in different shades and patterns with dark or medium gloss finish. One of the most beautiful flooring materials. Available in variety of colors and shades. Most popular species: oak, maple, cherry, hickory. Appropriate for most rooms. Best suits for bedrooms, playrooms, kids rooms, living rooms or other places where you walk barefoot. Not the best option for bathrooms. Best option for living room or bedroom. Can be installed on kitchen and in hallways but not recommended for installation in rooms with potentially high moisture level such as bathrooms, powder rooms or laundry rooms. Feels soft under the feet, but surface can be easily damaged. Harder surface, but still can be scratched or damaged by liquid spills. Cork floors are susceptible to pet urine and could be easily scratched by pet’s claws. Can be damaged by pet urine or scratched by claws. Wood can be stained and discolored spots might appear on floor surface if water, juice or pet urine won’t be cleaned from the hardwood promptly. Cork flooring is water resistant material and do not rot, but core layer which often made from MDF can be easily damaged by water. 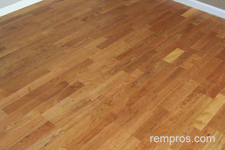 High moisture level in the room or spilled water can easily damage wood floors. Cork floors might change in color under light exposure. Direct sunlight can cause discoloring of wood floors. Some wood species might even change in color overtime under normal light intensity. Cork has unique elastic ability to regain original form after impact. Cork flooring is durable enough even for high traffic areas. Depends on species and finish quality, but most of wood flooring products are rated higher on Janka hardness scale compare to cork flooring. 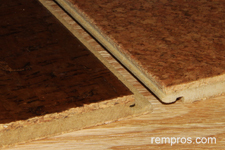 Cork has an excellent ability to absorb sound and it is one of the best thermal insulation materials. Do not lower transmission of sound in the room significantly, and it is not high efficient insulator. Elimination of any liquids from wood surface quickly will ensure long lasting flooring performance. Greatly vary, but normally 30 years limited wear warranty. 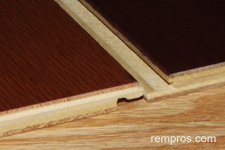 Warranty on hardwood flooring depends on a manufacturer and product quality. Most wood floors producers offer 25 – 55 years limited wear warranty on their products. Cases 36” – 48” long. Cases 36” – 84” long. 0.375 in. – 0.5 in. Wood floors made from trees which have to be cut and factory processed. Vary. Some products more expensive than engineered click lock wood flooring. Greatly vary and some wood floors might be quite expensive. Cost to install floating cork flooring similar to laying click locks engineered hardwood floors. Nearly the same as cork. Many homeowners are able to perform click lock floors installation as a do it yourself project. Installation of 12” x 36” cork flooring tiles in 11’x 14’ bedroom is normally a few hours task excluding removal of an old flooring material and preparation work. Experienced installer typically is able to complete installation of 5 in. wide engineered hardwood flooring planks in 15’ x 20’ living room in one day, not accounting any preparation or extra work. Can be scratched by heavy furniture or sharp objects, core layer can be damaged by water. Hardwood floors are susceptible to water damages and react on sunlight by changing the color. 1 Rating was estimated on the scale from 1 to 5, accounting 1 as lowest and 5 as the highest quality of a product. Always consider the fact: not all products made equally the same and performance of particular flooring material significantly depends on individual product quality, adequate installation, and proper maintenance. Floating cork and click lock engineered hardwood flooring have their own advantages and disadvantages, and which one to buy depends on many factors. Wood tends to be more desirable flooring material, but green flooring such as cork increasing in popularity and already an option not an alternative to traditional floor covering materials.